September saw another successful Groundswell NW participation at the 15th Annual Sustainable Ballard Festival. 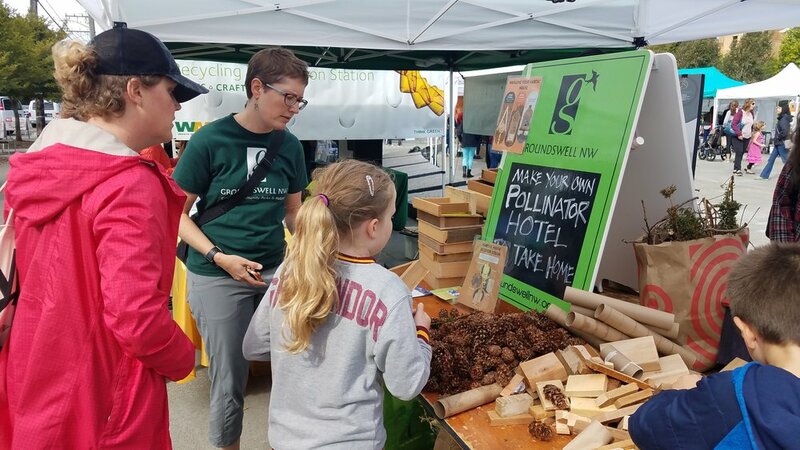 We continued our support of the NW Seattle Community Wildlife Habitat Project helping dozens of neighbors of all ages build their own "pollinator hotels" to take home. October presents a chance to celebrate a major accomplishment with the grand opening of GEMENSKAP PARK. Hurray! Join us and the East Ballard Community Association (EBCA) to celebrate the Grand Opening of the Park: Saturday, October 27, 2018, 10:30am-12:30pm. Groundswell NW planted the seed of an idea to "green" 14th Ave. NW in our 1998 North Salmon Bay Community Forestry Plan. EBCA took the reigns 13 years ago, developing a vision for park blocks all the way from NW 65th to Salmon Bay. It is an ambitious vision, and even these first two blocks have been a complex undertaking, making for a major cause for celebration. If you cannot attend the grand opening, get outside and enjoy the park now to experience fall seasonal changes. And while we reflect upon the change of seasons, we also are saddened by the recent passing of Rob Mattson, former long-time Ballard Neighborhood District Coordinator. Rob was instrumental in facilitating the development of many Groundswell projects over the years, connecting community members with City staff and helping cut through red tape. He will be missed.